You have the chickens, so what’s next? Goats! Goats need less land and feed than other livestock and can serve many purposes on a homestead. But what are their needs? A guest post by Kathi Rodgers of Oak Hill Homestead. Chickens are often called “gateway livestock” for homesteaders because they are easy to raise, don’t require a lot of care, and it’s relatively inexpensive to get started. But once a homesteader has chickens, goats are often the next species in line. Goats are multipurpose, they require much less land and feed than a dairy cow, and those bouncing baby goats are so cute! 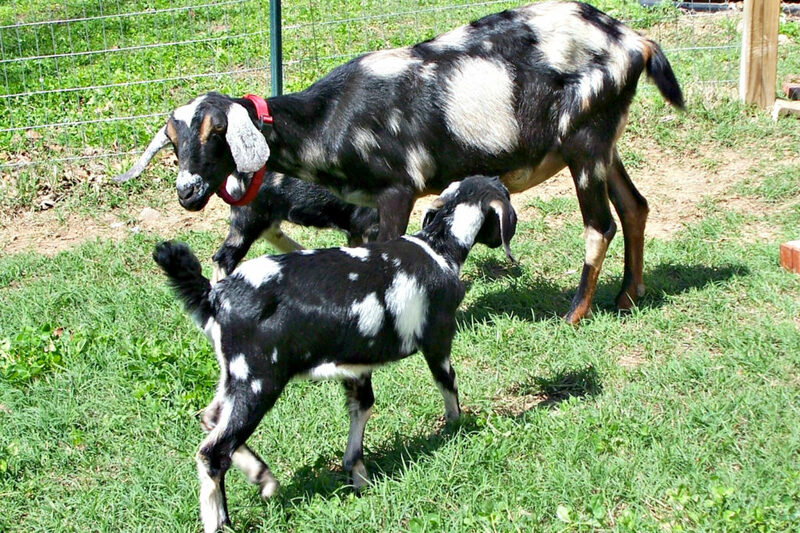 Raising goats seems to instantly raise your status from newbie to accomplished homesteader. Goats do have a bit of a learning curve though. Before you run out a buy a goat (actually, you should buy two, not one; goats are a herd animal and need company), let’s take a look at some of their needs, and how those needs change with the seasons. Goats need to be warm and dry in the winter, and cool and dry in the summer. Depending on where you live, a three-sided shed might be sufficient. In general, the open side of the shed should face the south or the east in the northern hemisphere, or the north or west in the southern hemisphere. There are exceptions of course — there always are. Take a look at your neighbors’ buildings to see which direction their buildings face, if they have three-sided sheds of their own. Your neighbors are probably experts on the local weather if they’ve lived there for awhile. If you live in a cooler climate, your goats might need an enclosed shed or barn with a door. An enclosed building is best if you have predators in your area such as coyotes, bobcat or mountain lions or, heaven forbid, bears. You’ll need to shut your goats up securely at night, especially when your goats have kids. An enclosed shed or barn should be well-ventilated though, even in winter. Screened openings high in the walls will help to keep varmints out, as well as prevent drafts that would blow on your goats and their babies. Fencing for goats is an important subject. We’ve all heard stories of goats that fences won’t hold; our neighbor had a large herd of goats that roamed wherever they wished, and often blocked our road. It’s true that goats are very hard on fences. We’ve tried many different kinds of fencing for our goats, and have decided that woven wire sheep-and-goat fencing with 2-inch-by-4-inch holes is the best solution for our herd. You can read about our experiences and fencing conclusions here. In the summertime, goats need a shady place where they can lie down and chew their cud during the hottest part of the day. Pay attention to the pattern of the shade as the sun moves throughout the day and the season. What is shady in early summer might not be later in the year. If you’re building a barn or shed for your new goats, plan the fences so that the shadow of the building is accessible to the goats for shade throughout the day. Be sure to provide plenty of ventilation in the goat shed or barn in the summer too. Research the direction of the prevailing winds and plan the location of the barn door and windows accordingly. Don’t use a household fan in the goat shed; these fans aren’t built to withstand the excessive amount of dust in a barn. Dust in the fan motor can cause a fire. If you feel that you must use a fan, purchase one specifically made for use in livestock barns. Goats are less susceptible to heat stress than most other species of livestock, but they still have special needs. 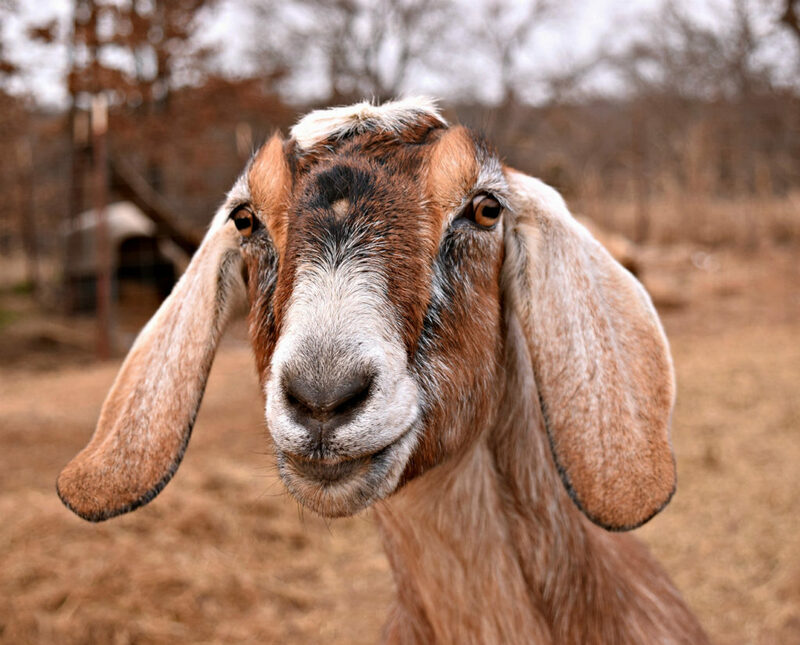 Nubian goats with their large floppy ears can usually handle heat better than those with small ears; the large surface area of their ears allows blood to circulate just under the skin and cool down. Likewise horns promote blood cooling in a similar manner. Clean water is important for goats, especially in the summer. Water is necessary to keep a goat’s digestive system working correctly. Pregnant does and does in milk will require additional water. Goats don’t want “more water,” they want “new water.” Instead of just adding more water to the trough daily, empty the water trough often and clean the inside thoroughly to prevent the buildup of algae, then refill with fresh water. A long-handled bath brush works well to clean water troughs. Place the water trough in a shady location to help keep the water cool during hot summer days and to slow the growth of algae. Don’t forget to provide your goats with free-choice loose minerals. Goats prefer loose minerals to a hard mineral block, but if your only choice is a mineral mix that doesn’t include salt, provide a salt block until you can source a mix with salt. Among other benefits, salt helps to maintain a healthy appetite and water intake. Also check the label on your minerals to ensure they are formulated for goats, not for both sheep and goats. A mineral mix for both species won’t contain the level of copper needed for goats; goats have a much higher need for copper. Many of the tips above are appropriate for goats in the winter too. A well-ventilated shelter, loose minerals fed free-choice, and plenty of good-quality hay are necessities all year round. There are special winter considerations too. Clean water is just as important in the wintertime, but you need to keep your goats’ water from freezing. I’ve found that water in metal buckets will freeze faster than in plastic buckets, and black rubber buckets stay warm the longest. If necessary, use an electric heated bucket to keep their drinking water from freezing. Outside, place your trough in a sunny spot so the sun will help keep the water warm. Young goat kids are fragile and chill easily, but heat lamps are dangerous in barns. If you feel you simply must use one, hang it securely in at least two ways. The clamp that comes with the lamp isn’t fail-proof and should be augmented with a chain and perhaps baling wire too. Better yet, don’t use a heat lamp. Instead, make simple no-sew goat coats to help keep your kids warm. Many goat owners use the deep bedding method, also called the deep litter method, in their sheds in the winter. Instead of cleaning the barn floor daily, they cover the floor with clean straw as needed, layer on top of layer. Underneath, the goat berries and hay begin to decompose and create heat that helps to keep the goats warm. In spring, the barn is deep cleaned and the bedding is further composted for use in the garden. For daily maintenance the rest of the year, I’ve found that using a plastic garden rake – also called a leaf rake – works best in my goat shed to rake up the goat berries from a dirt floor. A regular pitchfork and a stable fork will remove straw but not the “berries,” the tines are too far apart. When the seasons change and you spring clean your home and plant your garden, it’s time to change gears in the goat barn as well. Muck out that deep bedding and reveal the clean dirt floor once again. Put away the heated bucket for next winter. De-worm your goats, trim their hooves and if you give CD&T shots, now is the time to do so. Give your livestock guardian dog (LGD) his or her rabies shot. And enjoy the promise of warm spring days with your goats. 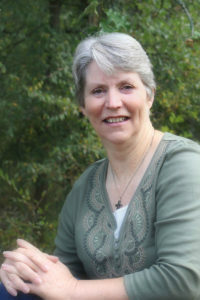 About the Author: Kathi Rodgers lives in Oklahoma with her husband, Nubian goats and her horse Ella. Her works have appeared in magazines such as Country Almanac and Iams Your Cat. Her mission is to inspire and encourage her readers to live a simple, joyful life, no matter their circumstances or where they live. You’ll find her posts at OakHillHomestead.com. Very informative! Thank you for sharing. I have been enjoying chickens for several years and keep considering adding two goats.